The Zenobia Consort is a Madrid-based chamber choir and with their director Rupert Damerell they made short visit to the UK last weekend giving concerts at Trinity College, Cambridge and St James's Church, Spanish Place, London as well as singing at Wesminster Cathedral. I caught up with the choir on Saturday 29 March at St James's Spanish Place where they performed a lunchtime concert of music for double choir by Victoria including the Ave Maria, Salve Regina, Missa Salve Regina, Super Fluminis Babylones, Alma Redemptoris Mater and the Magnificat primi toni. They opened with the two Marian antiphons, Ave Maria and Salve Regina published in the 1570's when Victoria was in Rome. The choir had around 40 singers and made a rich, warm sound, quite soft grained in tone but which filled the rich interior of St James's Church with Victoria's vibrant music. Damerell took a relaxed, almost gentle approach to the music with allowed it to breath and expand. 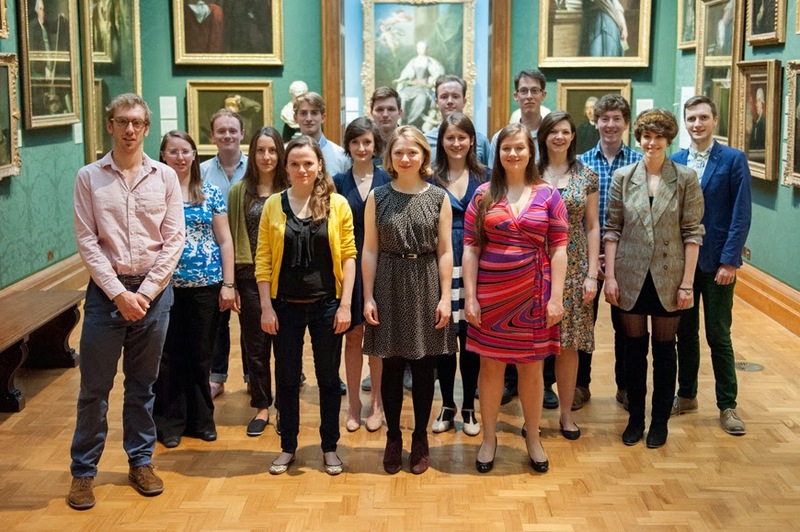 The Portrait Choir was founded in 2013 and is in residence at the National Portrait Gallery, with the aim of providing visitors with ways to appreciate both portraits and music. Linked to the National Portrait Gallery's exhibition of World War I portraits, the choir gave a concert Anonymity with New Century Baroque, conducted by Gregory Batsleer, the choir's artistic director. They gave a number of performances of the programme and I caught the first, on 29 March 2014. The programme directed by Donnacadh O'Briain interleaved Handel's music, mainly from his oratorios, with letters and poems written during World War I. The readings were given by actors Geoffrey Streatfield and Roger Watkins. The concert took place in room 20, so that we were surrounded by portraits from the early 19th century, testimony to another major conflict. The Portrait Choir consists of both professional and aspiring young singers, each section is led by a profession who mentors the young singers in their section. New Century Baroque is made up of former members of the European Baroque Orchestra and was formed in 2010. 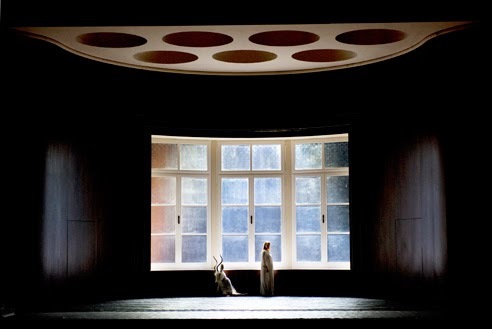 We caught up with Royal Opera's new production of Richard Strauss's Die Frau ohne Schatten on 29 March 2014. One of the Saturday performances; rather necessary when the opera starts at 6pm. (See Hilary's review of an earlier performance in then run.) I had seen the John Cox/David Hockney production at Covent Garden in 1992 and in 2001, along with Welsh National Opera's last revival of the opera in the 1980's. So I was fascinated to see what director Claus Guth, designer Christian Schmidt, dramaturg Ronny Dietrich and conductor Semyon Bychkov made of this wonderful, complex, fascinating, problematic and long opera. The curtain goes up on a wood panelled interior, smooth curved walls and a recessed window suggesting a stylised German interior of around 1910. A woman is in bed, a maid waits by the bed. The woman is the Empress (Emily Magee) and the maid is the Nurse (Michaela Schuster). In the programme book there is an article by Ronny Dietrich that makes it clear that all of the subsequent action can be taken as a dream. In Dietrich's, and presumably Guth's, opinion the only way the complex plot of the opera makes sense is to treat it as a dream, with the Empress working out her problems with her marriage and her relationship with her father. To this end not only were there animal avatars (falcon, gazelle, deer buck) played by actors with wonderfully stylish masks, who re-enacted aspects of the plot's back story but Magee's Empress was twinned with Elena Pankratova's Färberin, the one being the reflection of the other, and Magee was present on stage during much of the other action. 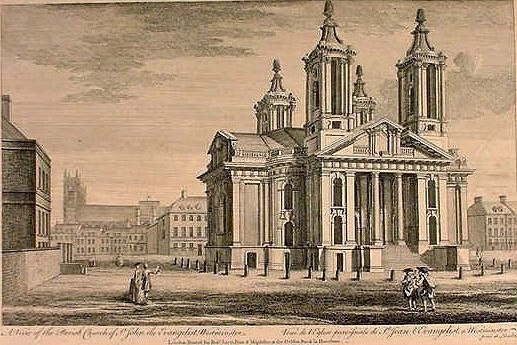 Schmidt's set for the whole opera was based on the Empress's room in the opening scene, but the central section of the rear wall was on a revolve which made for some spectacular scene changes, and at times a thrilling use of Covent Garden's stage. But the spectacle is not quite aligned to Strauss's score, so that whilst act two did have superbly brilliant moments, the Empress's encounter with her father Keikobad took in act three place in an empty room and we never saw the Emperor as stone statue. Instead the Empress seemed to deal with these in her head. Besides Benedict Cumberbatch in Hamlet the Barbican is planning a summer season based on constructing worlds and how artists are influenced by the cities around them – in particular the city of London. 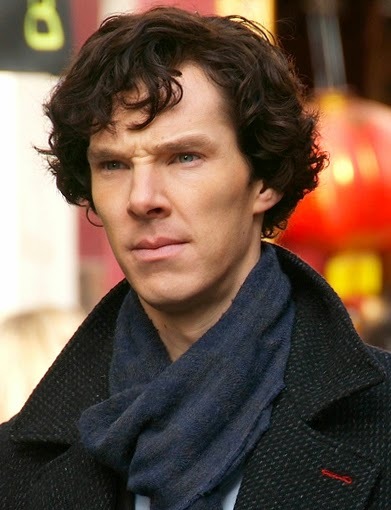 This involves art, 'Constructing worlds: Photography and Architecture in the Modern Age' and photographs from school children in east London, film (with a new commission about the life of the Barbican), theatre - Mr Cumberbatch and others, as well as cinema and music. Mr Cumberbatch aside, the Shakespeare celebrations include, on the 12 - 15 November, A Midsummer Night's Dream (As you like it) directed by Dmitry Krymov and in association with the Royal Shakespeare Company. Originally commissioned for the World Shakespeare Festival in 2012 it includes an opera singer, five meter tall puppets, ballerinas, and a performing dog. The Théâtre National de Nice is staging Peer Gynt 8 - 11 October. Directed by Irina Brook and featuring writing by Pulitzer Prize-winning Sam Shepard and music composed by Iggy Pop, in this version Peer Gynt is re-imagined as a rock star on a desperate quest for his inner self. April at the Barbican includes the English National Ballet commemorating the First World War, a residency from the Royal Concertgebouw Orchestra, Andrew Davis conducting two of Elgar's great oratorios, the BBC Singers in 20th century German masterworks and the Britten Sinfonia in a Bach passion. 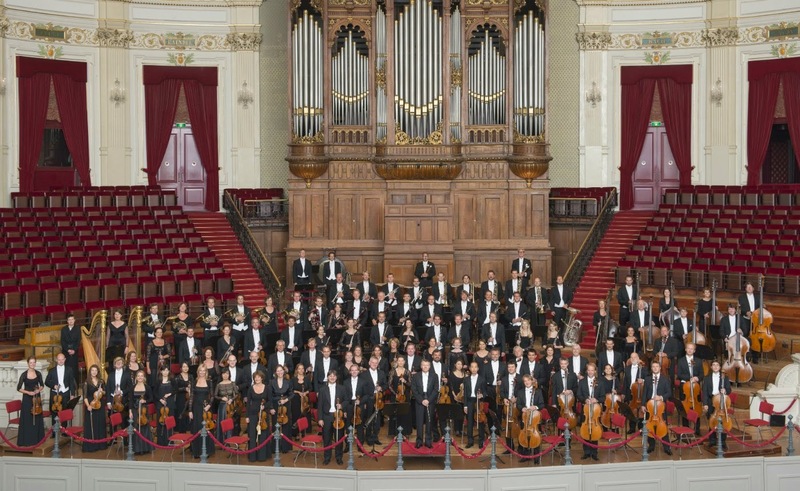 The Royal Concertgebouw Orchestra from Amsterdam has a three day residency (3-5 April 2012) with Mariss Jansons conducting them in Bruckner Symphonies nos.4, 7 and 9. 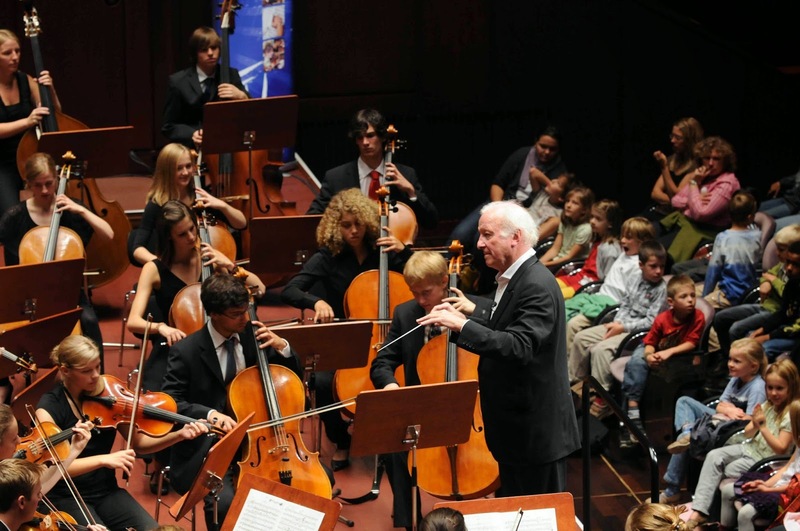 Players from the orchestra will also be giving masterclasses at the Guildhall School of Music and Drama. The conductor Gerd Albrecht (1935 - 2014) died in February this year. He had a long career, starting as a repetiteur in Stuttgart and taking in positions as senior Kapellmeister at Mainz Musicipal Theatre and Generalmusikdirector in Lübeck (where he was Germany's youngest Generalmusikdirector) before going on to be principal conductor of the Tonhalle Orchestra in Zurich (1975-80), the Czech Philharmonic Orchestra (1993-96), Yomiuri Nippon Symphony Orchestra (1998-2007) and the Danish National Symphony Orchestra (2000-04). He was also Generalmusikdirecktor of Hamburg Opera (1988-97). Highly active in the recording studio, he had a wide range, with a discography covering operas by Dvořák, Gurlitt, Janáček, Krenek, Mercadante, Meyerbeer, Puccini, Spontini, Schoeck, Schreker, Spohr and Wellesz. His desire to push the boundaries of the repertoire encompassed not only his espousal of lesser known operas, but his performing of contemporary music. Over several decades he gave numerous world premières of works by composers such as Henze, Ligeti, Reimann, Rihm and Schnittke, both in the concert hall and the opera house, including the world premiere of Reimann's Lear. I first came across him in the opera house when he conducted the Zemlinsky double bill (Der Zwerg and Eine florentinische Tragoedie), both operas based on stories by Oscar Wilde. The productions originated in Hamburg (and Albrecht recorded them with Hamburg forces) but I saw Albrecht conduct them in London. The repertoire was typical Albrecht, searching out the lesser known and showing it to be of striking quality, given in robust performances. There was a German kapellmeister quality to him which perhaps did not always endear him to critics in the UK, but his sympathies were remarkably broad just listen to his recordings of Dvorak and Spontini, two very different composers. 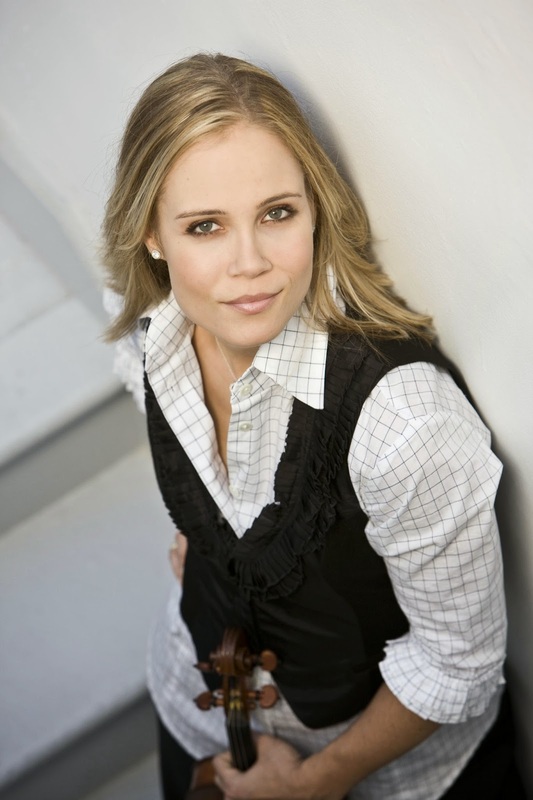 Leila Josefowicz's performance of Esa-Pekka Salonen's 2009 Violin concerto with the BBC Symphony Orchestra and conductor Sakari Oramo at the Barbican on 26 March 2014 was breathtaking. Canadian born Josefowicz moved to California with her family at an early age and started to learn violin from the age of three. Moving to Philadelphia she studied at the Curtis Institute of Music and, in 1994, made her Carnegie Hall debut with Sir Neville Marriner and the Academy of St. Martin in the Fields and received an Avery Fisher Career Grant. She played the first performance of Thomas Adès' 2005 violin concerto Concentric Paths (review of soloist Pekka Kuusisto performing with the Philharmonia Orchestra here) and has collaborated with John Adams and Oliver Knussen. First performed in 2009, Salonen composed his Violin concerto for Josefowicz as a commission from the Los Angeles Philharmonic. We have two tickets to give away for Thierry Huillet's recital at the Institut Francais as part of their It's All About Piano! festival which takes place from 4 to 6 April 2014. Huillet's recital is at 9pm on Saturday 5 April, and Huillet will be performing Debussy's Preludes Book II, plus the world premieres of Huillet's own Haikus on Water for Piano and Haikus for Piano. Huillet is fascinated by Japanese culture and in particular by haikus, which 'reach the essence through simple, brief evocation or description' and 'do not take sides or explain'. Having won first prize for piano, chamber music, and other disciplines at the Paris Conservatoire, at the age of 22 Huillet won the prestigious First Grand Prize in the Robert Casadesus International Piano Competition for Piano in Cleveland. Welsh National Opera has announced its new season, David Pountney's second season in charge, and it is a strong one. The operas are divided into three themed seasons, Liberty or Death! (Autumn 2014), Spellbound (Spring 2015) and A Terrible Innocence (Summer 2015). There is much to enjoy , with Summer 2015 bringing Richard Ayres Peter Pan, Mozart's Magic Flute and a new production of Debussy's Pelleas et Melisande whilst Spring 2015 includes Humperdinck's Hansel and Gretel, Magic Flute and a new extravaganza entitled Chorus. But it is the Autumn 2014 season which will be inciting the most interest, with a revival of Carmen plus Pountney's own new productions of Rossini's Guillaume Tell and Moses in Egypt. As with their Tudor Queens trilogy last year, WNO seems to be making a welcome space for bel canto opera. First Time Live with the RPO in Doncaster on Tue 25 March. My second visit to the Grimsby Auditorium in two days had the same orchestra on the platform (the Royal Philharmonic Orchestra), the same conductor (Benjamin Pope) but a very different audience. (See my review of the RPO's concert) As we arrived at the auditorium on the afternoon of 28 March streams of school children were queuing up to go in. We were greeted at the welcome desk by two local girls, and shown to our seats by a young usher. 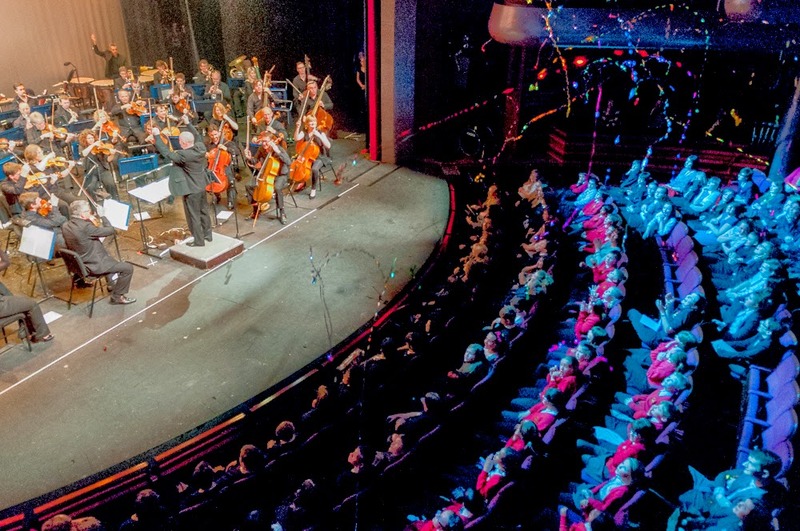 This event was organised as one of the national music charity Orchestras Live's First Time Live Youth event so that local young people were involved in every aspect of the performance. The audience was largely made up of primary school children from local schools. The adults in the audience were mainly teachers and those accompanying the children, but we were seated the small area at the back of the circle reserved for adult visitors. A screen at the back of the stage displayed the Orchestras Live and First Time Live logos, then Benjamin Pope came on and the orchestra struck up Copland's Fanfare for the Common Man. When it had finished two of the presenters came out to introduce the conductor, orchestra and the music. The presenters were also local young people. Photographer Amy T. Zielinski's exhibition Piano: Machine of Dreams tries to capture the passion and pain that goes into a pianist's performance. Her images show the stress of rehearsals, pressure of live performance, and challenge of recording. Those photographed include Benjamin Grosvenor, Alfred Brendel, Stephen Kovacevich, Katia Labeque, Paul Lewis, Marc Andre Hamelin, Imogen Cooper, Nelson Freire, Leif Ove Andsnes and Richard Goode. 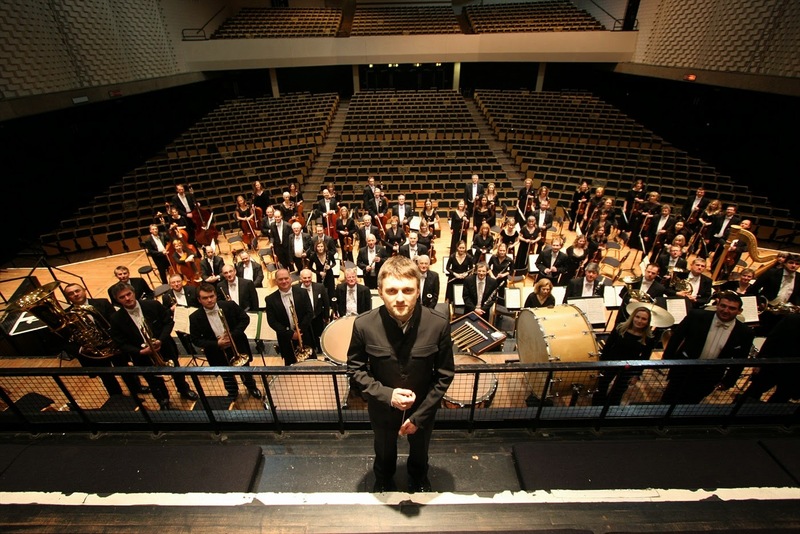 The Royal Philharmonic Orchestra paid a visit to the Grimsby Auditorium in North Lincolnshire, on 26 March 2014 giving a rare live orchestral concert in the town; generally Grimsby gets just one or two visits from major orchestras in a year. Benjamin Pope conducted the orchestra in Rossini's Overture to William Tell and Dvorak's Symphony No. 9 From the New World, and they were joined by the Romanian pianist Alexandra Dariescu for Tchaikovsky's Piano Concerto No 1. I was in Grimsby visiting relatives and to attend one of Orchestras Live's First Time Youth events, so it seemed a good opportunity to hear the orchestra and Dariescu performing in my home town. Frankly, the Grimsby Auditorium is a relatively unlovely venue for a concert, with an ambiance more resembling a sports hall with seats. The orchestra had been placed on the platform. But surrounding them with curtains rather than reflective surfaces meant that the sound quality was not optimal, with the strings particularly rather lacking in bloom. But none of this mattered as Pope and the orchestra gave a vividly engrossing performance, which gave no hint at all that they had played these works many times before. Rossini's overture to his opera William Tell was written for its premiere in Paris in 1829. The overture has long had an independent life in the concert hall, with the final section being well known for its use in the TV series The Lone Ranger. The performance opened with a fine grained account of the prelude for five solo cellos. The subsequent thunderstorm with exciting with tightly controlled rhythms, leading to some lovely wind solos in the pastoral section. The final galop was crisply exciting, with some finely disciplined playing. The whole had a lovely crisp, new-minted feel. 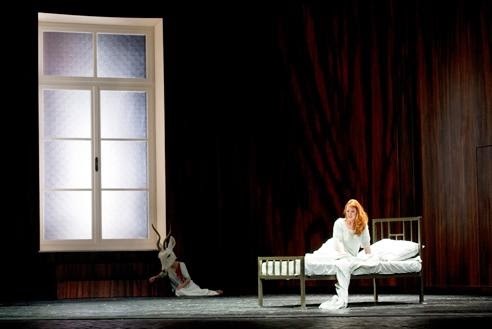 Die Frau ohne Schatten by Richard Strauss (1864-1949) at the Royal Opera House was a deliciously dark fairy tale. This gothic and surreal adaptation by director Claus Guth was dream-like and confusing. Only once I got home and read the synopsis did I understand why I was having so much trouble - much of the explanations were missing. This four and an half hour long production was massively cut from Strauss' original and Hugo von Hofmannsthal's libretto, but the performances and music shone through to make it a production not to be missed. Much of my confusion was centred around the 'fairies'. It was hard to know whether the Emperor (Johan Botha) and Empress (Emily Magee) were from another realm or human, and how Keikobad (the Empress' father) fitted into the scheme. Adding to this there was another layer with Philip Pullman's daemon-like masked figures: a gazelle symbolising the Empress' life before she was married and her internal thoughts, a falcon (Anush Hovhannisyan) symbolising her capture and singing damning portents (the Emperor will turn to stone), and an oddly menacing stag. I never quite worked out who the stag was meant to represent, the Emperor or Keikobad, but he was lovely to watch. The three figures were fantastically portrayed with beautifully stylised movements - I could have looked at just them with Strauss' music and been happy. The South London Concert series is an imaginative series of concerts which bring together professional and amateur musicians in intimate concert settings in South London. 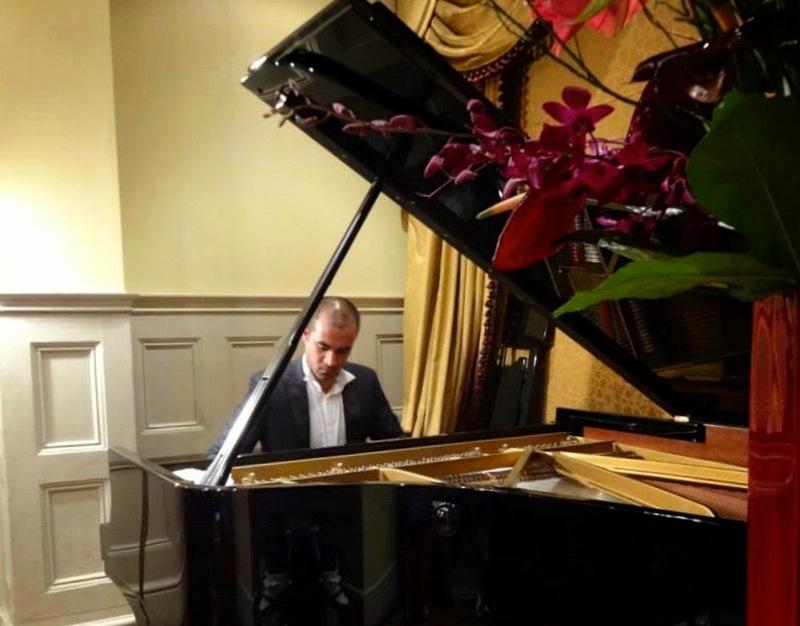 On 3 April 2014 their latest concert takes place in the Saloon at Brunswick House in Vauxhall, an elegant 18th century house which is now home to Lassco architectural salvage and the Brunswick House Restaurant. 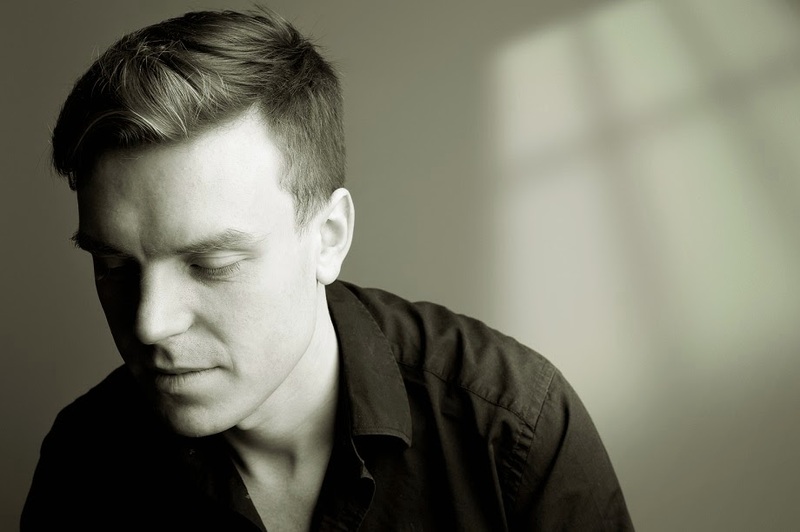 Thursday's concert is being given by Emmanuel Vass, BBC Music Magazine's March rising star. Vass is playing Turina, Granados and Chopin, and he will be supported by pianists from the London Piano Meetup Group. Ticket prices include a glass of prosecco and there is the possibility to join the performers in the restaurant afterwards. 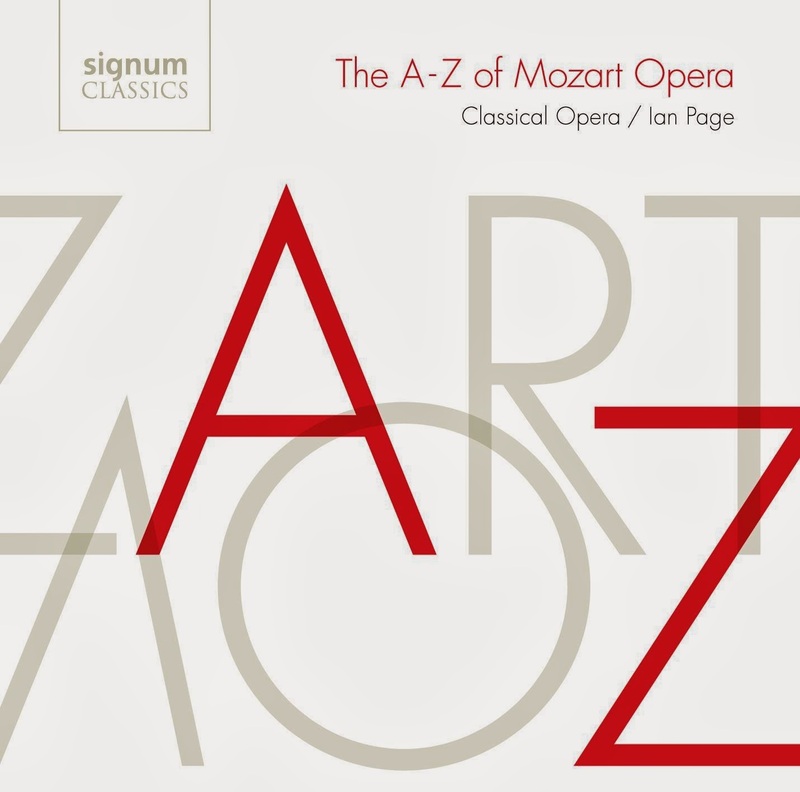 This reissue (now on Signum originally on Sony BMG) acts as something of taster for Classical Opera's ongoing project recording the complete Mozart operas. This disc includes music from each of Mozart's operas presented in chronological order. Recorded in 2007, the disc is a compilation of some fine lyric voices, some 11 singers in total, performing one aria or ensemble each from 15 operas, with Ian Page conducting the Orchestra of Classical Opera. One of the charms of the disc is not just the way it gives us an overview of Mozart's operas, but also an interesting overview of a cross section of young singers. We start with Apollo et Hyacinthus (1767), written before Mozart became a teenager. The duet Natus cadit, sung by Martene Grimson and Allan Clayton, is a lovely lyric item with two flexible voices in shapely form. Rebecca Bottone sings the aria Amoretti, che ascosi qui siete from La finta semplice with a lovely line and beauty of tone. In both of these it is amazing how many fingerprints from Mozart's later operas are discernible. Matthew Rose then sings Diggi, daggi, schurry, murry from Bastien und Bastienne which is a highly characterful piece. Say the words Borodin and Prince Igor to any music lover and they will almost certainly be able to hum something from the Polovtsian Dances, but press them further and they probably know little else about the opera. Covent Garden did a production in 1990 (alas never revived) conducted by Bernard Haitink, with Anna Tomowa Sintow as Yaroslavna, and Opera North have produced it (conducted by David Lloyd Jones with Margaret Curphy as Yaroslavna), but otherwise to see the piece a UK opera lover must either travel or rely on visiting opera companies. (Valery Gergiev and the Kirov/Mariinsky Company brought it to Covent Garden in 2002). Next week Novaya Opera is making its UK debut and bringing its new production of Borodin's Prince Igor to the London Coliseum. The Moscow based opera company is performing in London as part of the year long UK-Russia year of culture. The performances are conducted by Novaya Opera's principal conductor, Jan-Latham Koenig, directed by Yuri Alexandrov and designed by Vyachaslev Okunev. 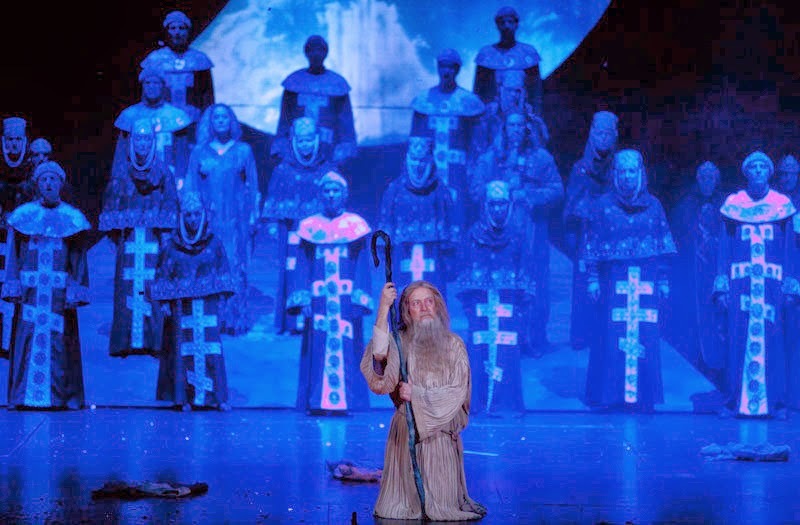 The cast for the first night includes Sergey Artamonov as Prince Igor, Evgeny Stavinsky as Prince of Galich, Elena Popovskaya as Yaroslavna, Aleksey Tatarintsev as Vladimir Igorevich, Vladimir Kudashev as Konchak and Agunda Kulaeva as Konchakovna. This year is St John's Smith Square's 300th Anniversary and they are celebrating in fine fashion. 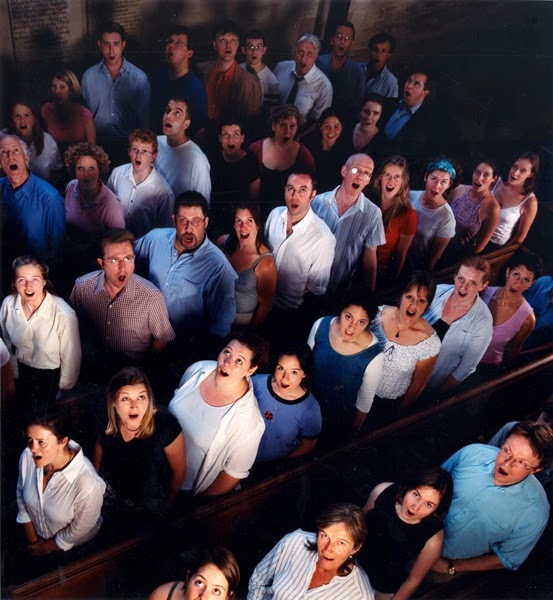 The new season starts with a bang with the London International A Cappella Choir Competition, with 12 choirs competing and a jury chaired by Peter Phillips of the Tallis Scholars (22-26/4). Tallis Scholars will also be giving a concert to launch the competition (21/4). Other tempting events include appearances from the Joyful Company of Singers, as well as the launch of a Handel oratorio series. The Lufthansa Festival of Baroque Music celebrates the year 1714, whilst Richard Strauss's 150th birthday is celebrated. Other visitors include sopranos Ruby Hughes, Danielle de Niese and Joan Rogers all in recital. Last night (24 March) the Polish Cultural Institute hosted an event at the Polish Embassy in Portland Place, which both celebrated the centenary of Andrzej Panufnik and helped to launch the release of Panufnik's 1987 recording of his Bassoon Concerto and Sinfonia Di Speranza. Present were Panufnik's widow Camilla Lady Panufnik, and the distinguished bassoonist Robert Thompson who commissioned the Bassoon Concerto. Also present were the Polish bassoonist Arek Adamczyk and pianist Jacek Kortus who played gave us some live music, playing excerpts from Panufnik's concerto along with movements from Rossini's Bassoon Concerto. In her introduction Lady Panufnik commended Robert Thompson for his courage commissioning the Bassoon Concerto from a composer whose work he did not know well (the two were introduced by Panufnik's publisher). But Panufnik and Thompson went on to work on the concerto closely. 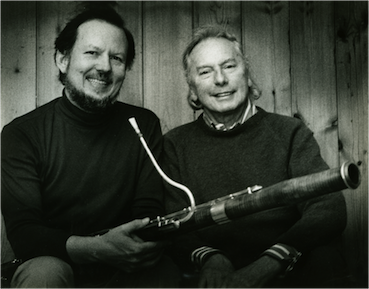 Thompson talked about the work's genesis, and how Panufnik first asked him what where the most beautiful notes on the bassoon that he wanted to play. 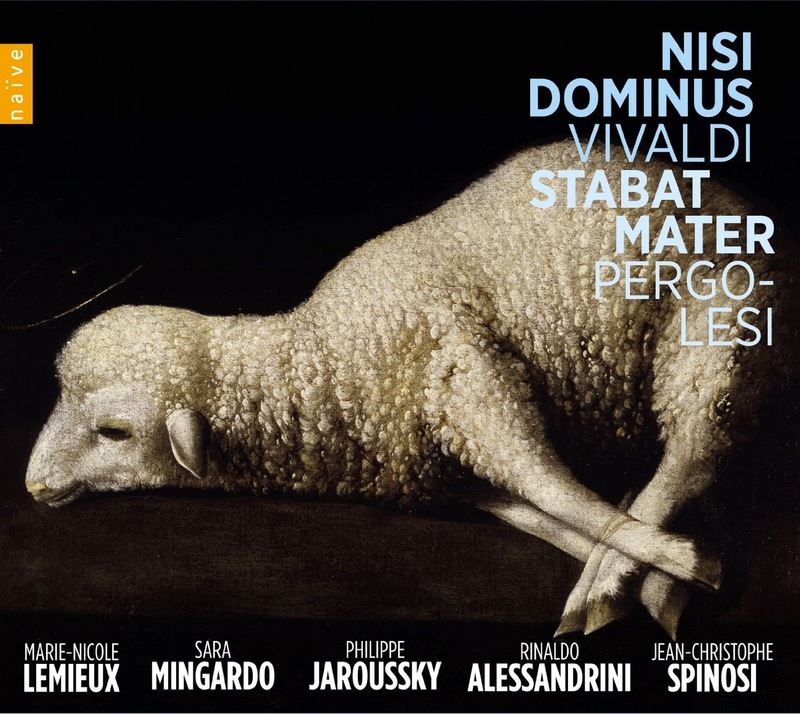 This re-issue from naive parcels together two discs of 18th century Italian sacred works, so that you get Philippe Jaroussky, Marie-Nicole Lemieux, Ensemble Matheus and Jean-Christophe Spinosi in Vivaldi's Nisi Dominus and Stabat Mater (from 2007), plus Gemma Bertagnolli, Sara Mingardo, Concerto Italiano, and Rinaldo Alessandrini in Pergolesi's Stabat Mater and Alessandro Scarlatti's Stabat Mater (from 1998), with only linking theme for the discs being the Stabat Mater. What you get is a remarkable overview of 18th century sacred music, and also a striking variety of performances. The Holst Singers is joining forces with the City of London Sinfonia, the Hilliard Ensemble and conductor Stephen Layton to perform Arvo Part's Litany. Written in 1994/1996, Litany's subtitle is Prayers of St John Chrysostom for each hour of the day and night which Part has set for vocal ensemble, choir and orchestra. The performance forms part of a concert at Southwark Cathedral on 27 March, with John Tavener's Supernatural Songs, his 2003 settings of W.B. Yeats late, Hinduism-inspired poems, and the UK premiere of Gavin Bryars The Voice of St Columba. (Further information from the Spitalfields Music website). The Holst Singers and Stephen Layton will be performing more John Tavener on 10 April, when they given concert of his a cappella music including The Lamb, The Tyger, Funeral Ikos and Song for Athene. The concert takes place at Christ Church, Spitalfields on 10 April 2014 at 9.30pm (further information from Spitalfields Music). The concert will be preceded by a performance of Tavener's The Protecting Veil given by the City of London Sinfonia, with cellist Matthew Barley and conductor Stephen Layton. Barley and the orchestra will also be playing some of Barley's arrangements of Brazilian music inspired by his time in the Brazilian rainforest. (further information from Spitalfields Music). If you book for all three concerts then Spitalfields Music is offering 15% discount. The concerts are also part of the City of London Sinfonia's Natural/Supernatural series, which also includes a performance of Messiaen's Quartet for the End of Time on 23 April 2014, one of their CLoSeR events at Village Underground. Elgar’s Dream of Gerontius was performed at the Royal Albert Hall (19 March 2014) by the Royal Philharmonic Orchestra with the combined voices of the City of London Choir, Guildford Choral Society, Leicester Philharmonic Choir, and Choirs from St Paul’s Girls’ School as part of the 70th birthday celebrations of the conductor Hilary Davan Wetton’s. All the choirs involved have at one time been intimately associated with Wetton and at this concert several members of his family were also singing. 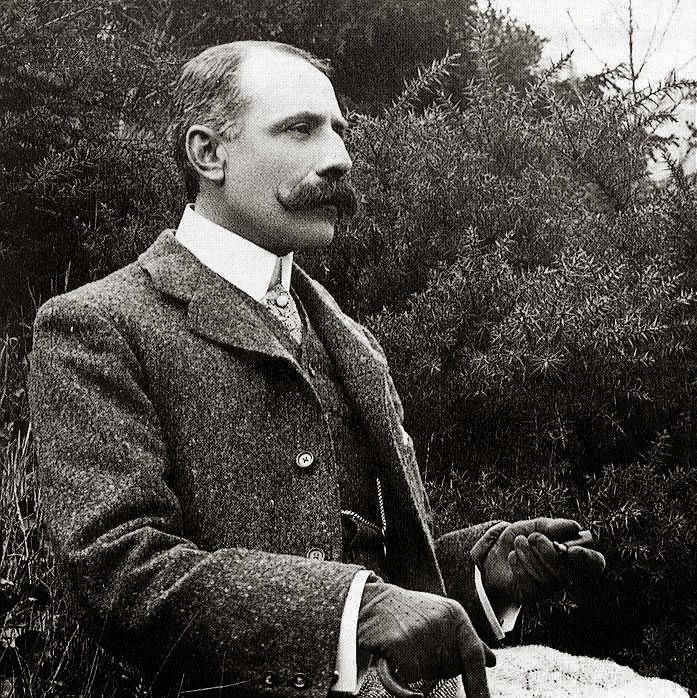 Edward Elgar (1857-1934) was a quintessentially English composer, one of a handful (including Ralph Vaughan Williams) who immediately come to mind when thinking about the English sound in the late 19th and early 20th century. He was born near Worcester to a musical family - his father William was a violinist and organist and, despite travelling and relocating for work, returned time and again to the area. Based on a poem given to Elgar in 1889 as a wedding present on the occasion of his marriage to his former pupil Caroline Alice Roberts, The Dream of Gerontius was written for the Birmingham Triennial Music Festival of 1900. 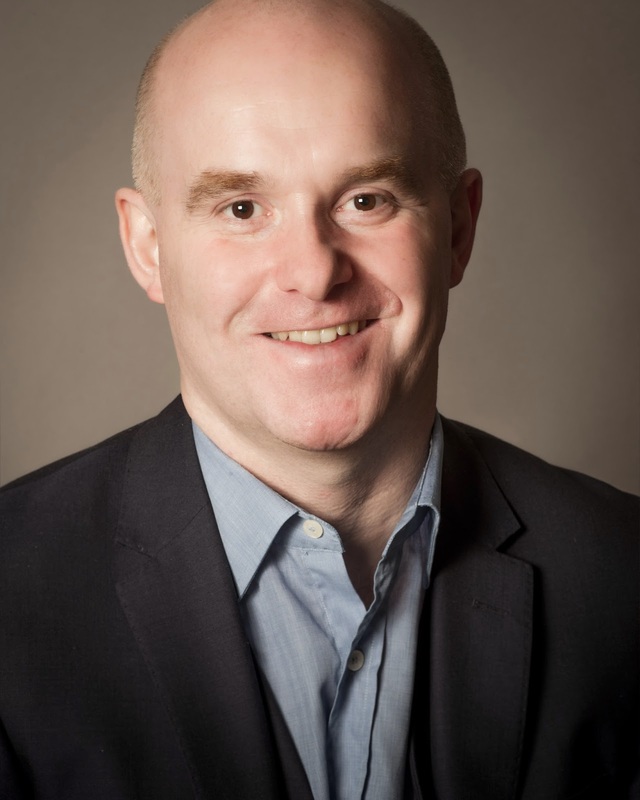 Roger Wright has been announced as the new Chief Executive of Aldeburgh Music, following on from Jonathan Reekie. Wright is currently the Controller of BBC Radio 3 and Director of the Proms; he will take up his appointment at Aldeburgh in September. Wright has been Controller of BBC Radio 3 since 1998 and Director of the Proms since 2003, during which time he has played a fine balancing act between the forces of popularisation and those who frown at any feeling of dumbing down, with the general view that he has done an excellent job at Radio 3, emphasising live music and strengthening support for young artists, as well as pioneering in digital projects, and building productive partnerships. Wright started his working life at the old British Music Information Centre in Stratford Place, before going on to spend periods at the BBC (as Senior Producer with the BBC Symphony Orchestra), the Cleveland Orchestra and at Deutsche Gramophon. Jonathan Reekie (who is moving to Somerset House), has done much to revitalise Aldeburgh Music and will be a difficult act to follow. Even more interesting, perhaps, is who the BBC will choose to replace Wright at the head of Radio 3. If you mention Isobel Baillie's name nowadays, it would probably call to mind the 1938 recording of RVW's Serenade to Music in which she sang the top soprano part, or perhaps her recording of Elijah. 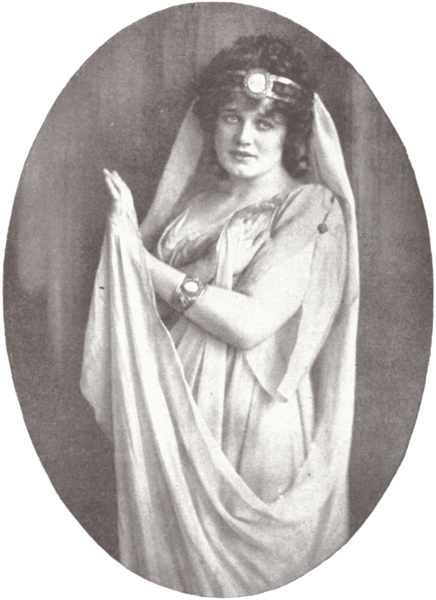 But for much of her professional life (and it was a long one) Baillie was one of the most famous British sopranos. In the 1950's the top line-up for an oratorio would include her, Kathleen Ferrier and Heddle Nash. 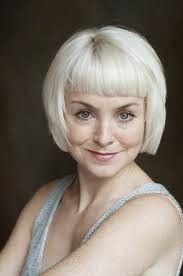 Her highly focussed tones are extremely distinctive, once heard never forgotten. And she preserved her voice into old age, I heard her perform at a lecture recital when she was in her mid 70's and the results would have shamed many far younger singers. Isobel Baillie (1895 - 1983) had a career which is representative of a style of music making which has almost disappeared. She didn't go to music college and much of her early career was based in small concerts and oratorios in chapels, churches and halls around her native Manchester. And her career was a long one, she started singing when she was in her mid teens and was still singing in her 60's. In a sense she never stopped as I heard her in her late 70's still performing, still with that same superb technique (you can hear 1974 recording of Hamilton Harty's The Stranger's Grave on YouTube.. In 1921 at the age of 26 Isobel Baillie wrote to Hamilton Harty, then newly appointed director of music at the Halle in Manchester. She detailed her experience and requested an audition; Harty granted her an interview but to her surprise he did not audition her as he had already heard her. Baillie had sung in a concert for her singing teacher's son, Eric Fogg, and Harty had been there. Harty gave Baillie an engagement and it was the start of a long and profitable association. 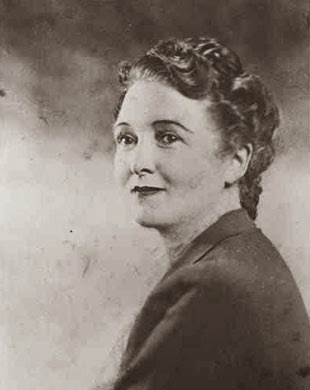 Baillie would be much associated with the Halle for the remainder of her career. What to do with Haydn's Seven Last Words? 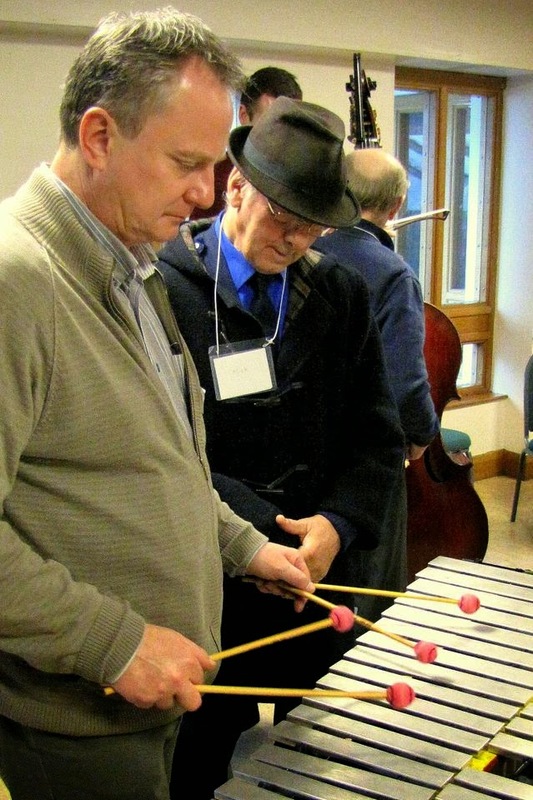 It is ideal string quartet repertoire for Lent, but programming is a problem in a work designed to be interspersed with sermons - an option few concert promoters would dare risk nowadays. The Aspect Foundation is presenting the Endellion String Quartet in Haydn's great work, and they are interspersing the movements with Ruth Padel's poetry, Seven Words and an Earthquake. Each of Haydn's movements is a meditation on one of Christ's last words, and each of Padel's poems ends with the Word, setting up an interesting tension and dialogue with the music. 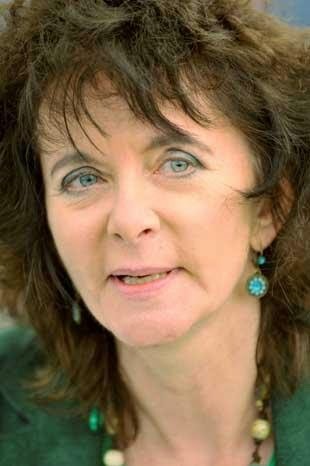 Ruth Padel will be reading her own poetry, with the poems taken from her forthcoming collection of poems on and around the Middle East (Learning to Play an Oud in Nazareth, Chatto, July 2014). She is joined by the Endellion String Quartet who have just celebrated their 35 anniversary. The concert takes place at the 20th Century Theatre, Westbourne Grove on 26 March 2014 at 7.30pm. Further information from the Aspect Foundation website. To celebrate the opening of Rossini's Otello at the Théâtre des Champs-Elysées on 7 April 2014, I have an article about Rossini's Neapolitan operas on the Forum Opera (website in French). Rossini wrote nine opera seria for Naples, starting with Elisabetta Regina d'Inghilterra and including Otello, Ermione and La donna del Lago, each in its way quite amazing and each starring star soprano Isabella Colbran and tenor Andrea Nozzari. The image is of tenor Giovanni David who played Rodrigo in Otello. The article sheds background on what went in to making these opera. 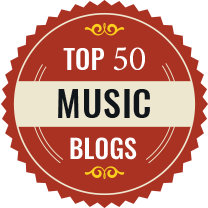 For those that read French, see the Forum Opera website. Nicola Benedetti is the artist in residence at this year's Cheltenham Music Festival, performing in a whole series of concerts. There are 15 commissions and premieres in the festival including works by Richard Blackford and John Tavener plus Nicola LeFanu's opera Tokaido Road. 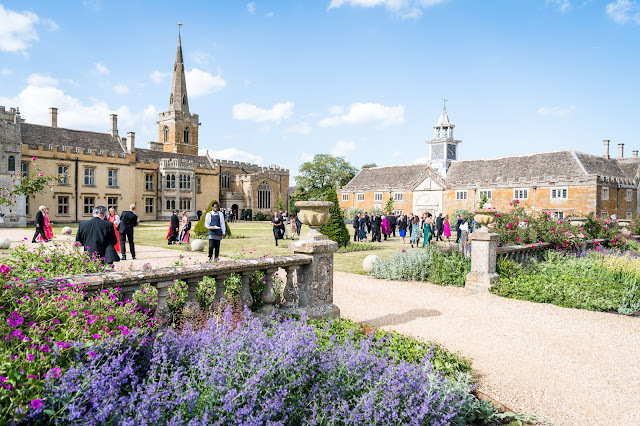 As ever there are concerts in a whole variety of lovely venues, including Owlpen Manor, Tewkesbury Abbey and Gloucester Cathedral. New to the festival is a series of Town Hall Festival Proms in Cheltenham Town Hall, including one where the audience picks the programme. 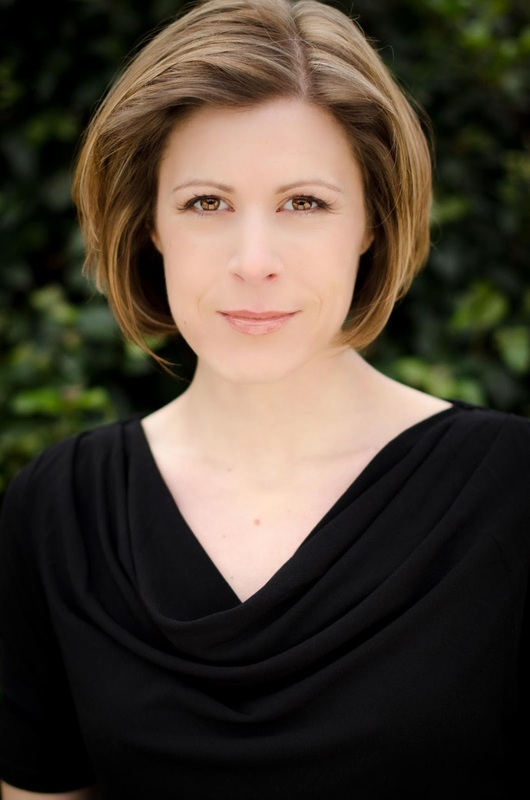 The Incorporated Society of Musicians (ISM) is planning to commission a new work from by Kirsty Devaney, a young composer based in Birmingham, to be premiered at ISM's annual conference in Birmingham on 16 April 2014. The work, for strings and percussion, will be performed young musicians who are part of the In Harmony projects in Liverpool and Telford & Stoke-on-Trent supported by Sistema England. To help fund the new commission and put on the concert, the ISM has turned to crowd-funding to raise the £5,000 necessary. This is both a wonderful opportunity for the young musicians who will premiere the piece, and great exposure for the work of In Harmony. You can support the appeal at the dedicated page. Building on the success of the first Barnes Music Festival in March 2013, the 2014 Festival will take place over an extended two week period between Saturday 22nd March – 6th April at venues across Barnes. The Festival's theme is 'Three Greats: Elgar, Delius, Holst and the English Tradition', and marks the 80th anniversary of the deaths of these landmark composers. 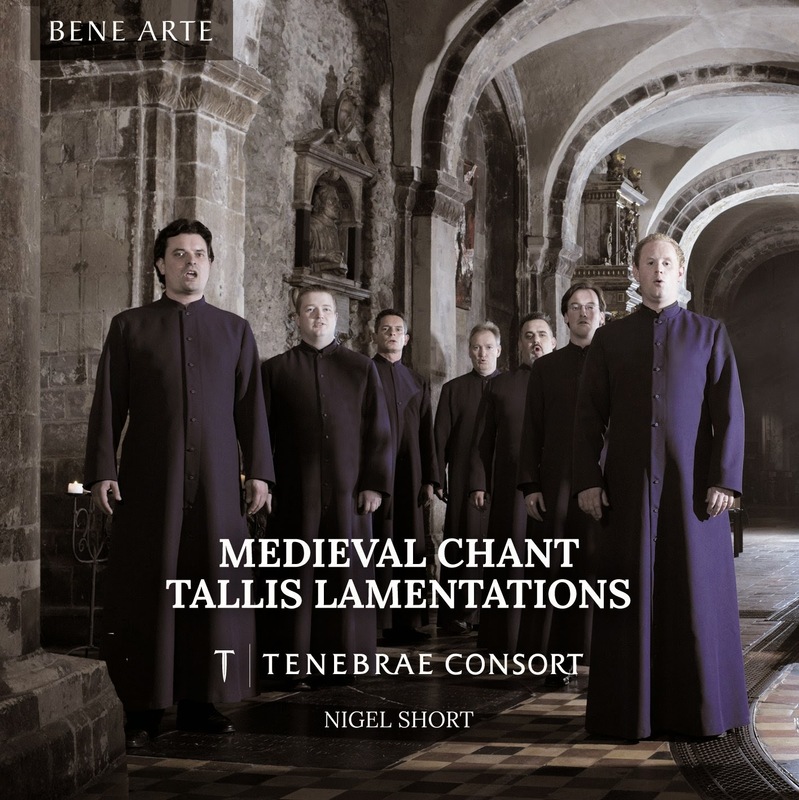 This new disc on Signum from Nigel Short and the Tenebrae Consort is described as a sequence of chant and polyphony for Holy Week. In fact it rather imaginatively consists of the entire plainchant service of Compline, plus a number of other plainchant items which fit nicely with it along with Thomas Tallis's Lamentations of Jeremiah and John Sheppard's In manus tuas I, a setting of the respond for Compline in Passiontide. The Tenebrae Consort consists of four singers, Guy Cutting, Nicholas Madden, Richard Bannan and William Gaunt, directed by Nigel Short with David Allsopp joining the group of the polyphonic items. The Northern Trust has announced that it is collaborating with the Royal Philharmonic Orchestra's (RPO) Community and Education programme, RPO Resound, to establish the Northern Trust: Young Person's Music and Mentoring Programme. RPO Resound was established by the RPO in 1993 and its aim is to promote music through artistically driven projects with groups from primary schools to homeless shelters. The collaboration with Northern Trust will support greater outreach for the programme in London, with Northern Trust's support focussing on three main groups, primary school children, looked after children and children with special educational needs. In addition, Northern Trust already has a community partnership programme which enables permanent employees to spend two paid days of the office per year supporting charity and community initiatives. 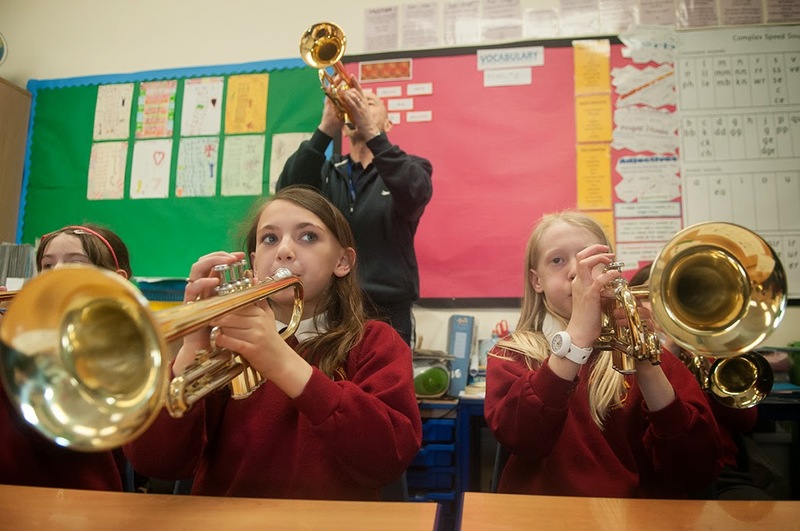 The collaboration with RPO Resound offers Northern Trust employees the opportunity to volunteer and mentor children taking part in the projects The first project launches on 21 March with a group of primary school children in Lewisham. 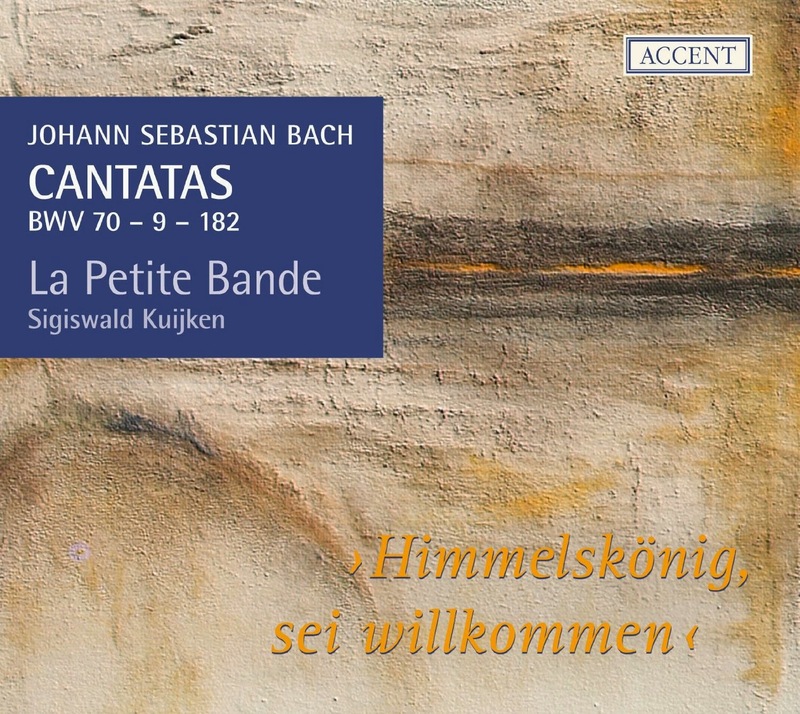 This recording follows the one to a part principle which we know applied to much of Bach's vocal output (particularly the cantatas), and Kuijken's attention to detail also runs to concern for the bass line of the instrumental line up. Here we have a basse de violon in the ensembles, but they also use a violoncello da spalla, a curious instrument which was a small cello played on the arm and which we are beginning to recognise as important. The final of this year's London Handel Singing Competition took place at St George's Church, Hanover Square, London on Tuesday 18 March 2014. 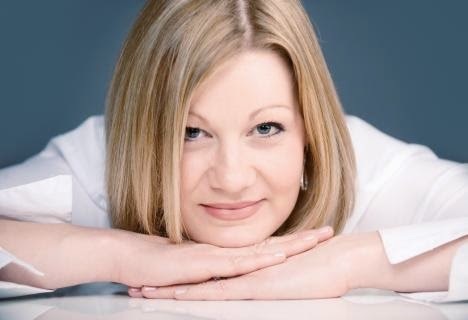 The winner this year was the Polish mezzo-soprano Ewa Gubańska, winning the Regina Etz Prize. 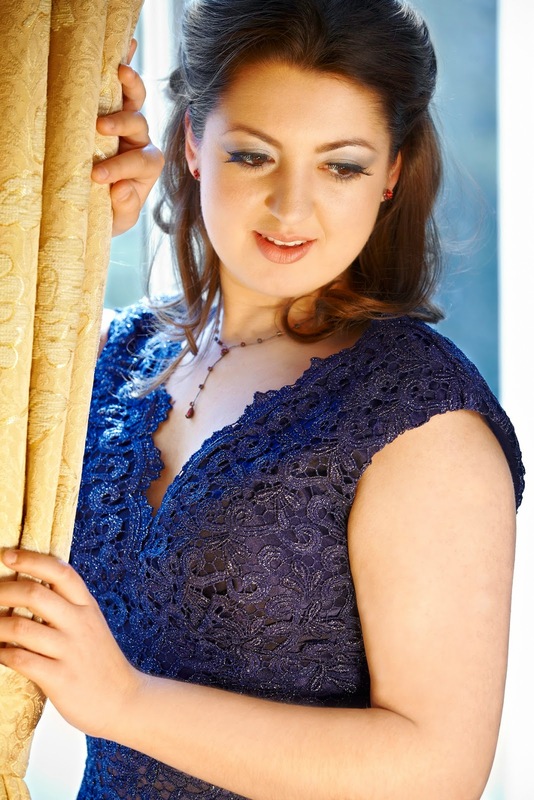 Gubańska sang arias from Giulio Cesare in Egitto HWV17, Alcina HWV34 and Arianna in Creta HWV32; she is currently studying baroque singing with Gloria Banditelli at the Bologna Conservatory of Music. 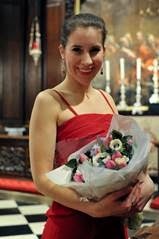 Soprano Maria Valdmaa took second place, receiving the Michael Oliver Prize as well as the Michael Normington Audience Prize. The other finalists were Susanna Fairbairn, Edward Grint and Timothy Nelson. The top prizes include an appearance at the London Handel Festival 2015, and all finalists will be offered a lunchtime recital. The adjudicators were Ian Partridge, Edward Blakeman, Catherine Denley, Michael George, John Mark Ainsley and Patrizia Kwella. The finalists were accompanied by members of the London Handel Orchestra, conductor Laurence Cummings. 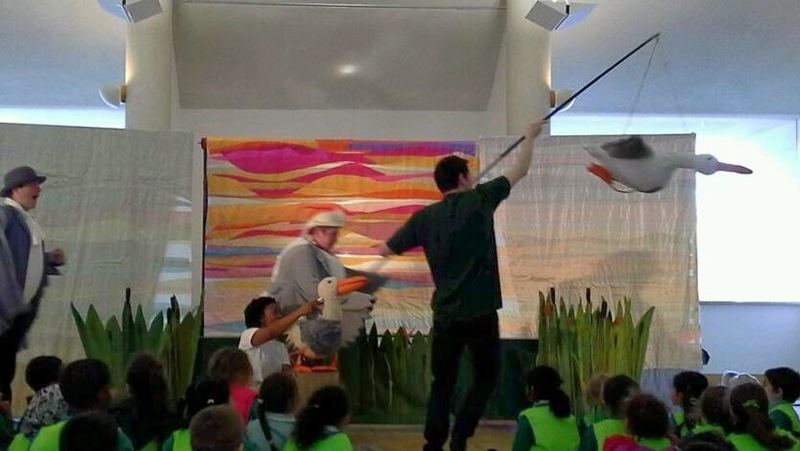 For the children's opera on its 2014 Spring Tour, English Touring Opera has turned to one of the most well-known and loved of all children's books, John Burningham's Borka which celebrated its 50th anniversary in 2013. The opera Borka, the Goose with No Feathers is designed for children aged 3 to 7 and ETO is touring the piece this spring alongside Tippett's King Priam, Britten's Paul Bunyan and Mozart's Magic Flute (in fact the four singers in Borka also appear in the other operas too). I caught one Borka's opening performances yesterday (20 March 2014) at Kew Gardens, an apt venue as part of the opera takes place there! With an audience of 110 five to seven year olds from local schools and 30 or so adults I watched the new piece not in a theatre, but in a flexible modern hall with the children sitting on the floor, the adults on chairs and the opera seemingly unpacked from boxes! Borka is produced by the same team responsible for last year's Laika, the space dog; composer Russell Hepplewhite, writer and director Tim Yealland, designer Jude Munden. Hepplewhite conducted a small band (Philip Turbett, bassoon, John Rogers, viola and Jonathan Raper, percussion) and the opera was performed by four singers (Abigail Kelly, Susan Moore, Matt Ward and Maciek O'Shea) with actor Dafydd Hall Williams. On Saturday 22 March 2014, Richard Strauss's Le Bourgeois Gentilhomme gets a rare Welsh outing as he visits Cardiff's Dora Stoutzker Hall (at the Royal Welsh College of Music and Drama) in the company of the Sinfonia Cymru, conductor Gareth Jones and actor Richard Harrington. The work has a slightly complex history. Originally Strauss and Hugo von Hofmannstahl planned a small entertainment which would take a cut down version of Moliere's play (adapted and translated by Hofmannstahl) in which the final entertainment was replaced by an opera Ariadne auf Naxos. It didn't work, the whole was too large and too complex (and needed a company of actors and an opera company). 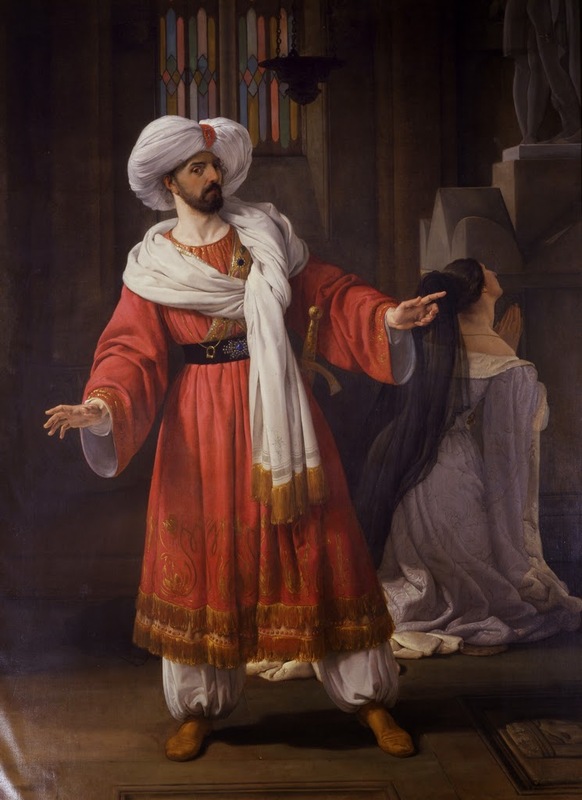 The opera, Ariadne auf Naxos, took on a life of its own and Strauss re-worked the incidental music to work without it, creating music for the dropped Turkish ceremony in the play. He then turned the incidental music into a suite, which is what Sinfonia Cymru will be playing. For their performance Sinfonia Cymru have turned to the actor Richard Harrington who will be reading extracts from the original Moliere play, to put the music in context. Also in the programme will be Strauss's wonderful Metamorphosen for 23 solo strings. Rupert Charlesworth won both the 1st Prize and the Audience Prize at the 2013 Handel Singing Competition (and having heard him in this recital, I can understand why). Part of the prize is an appearance at the following year's festival; in face this recital was one of two he was giving at the 2014 festival. Giving recitals in aristocratic salons was a regular part of Handel's performance schedule, as these helped to promote and gain subscribers for his opera and oratorio seasons. Such performances might include his own improvisations at the harpsichord, as well as accompanying singers in choice selections from forthcoming operas or oratorios. Charlesworth and Cummings recital gave us a little taste of this both in the musical programme and in the recital's location. 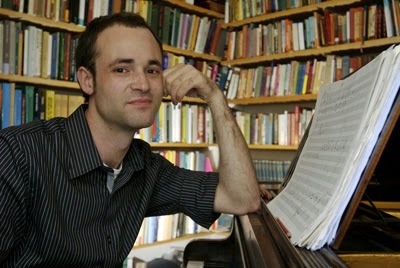 The young British composer/pianist Nathan Williamson has a work being in the USA this week. Transatlantic Flights of Fancy is being performed in Chicago (19/3) and in Michigan (20/3) by members of the NOW ensemble who premiered the work in December. Also this week the composer himself, who studied composition at Yale University, will be hard at work in his native UK as he is the soloist in a performance of Brahms's mammoth Second Piano Concerto on 21 March. 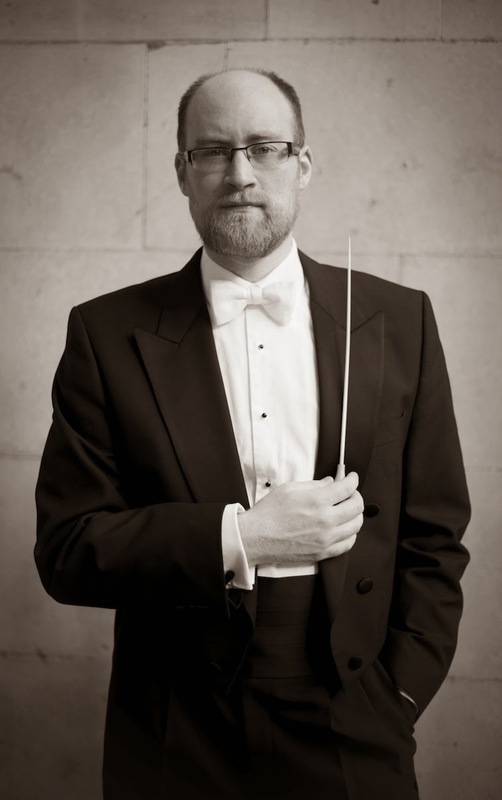 The concert takes place at St. James's Church, Piccadilly and Williamson will be performing with the Corinthian Chamber Orchestra, conducted by Adrian Brown. The programme also includes music by Beethoven and Mozart. To the crypt gallery at St. Martin in the Fields last night for a lovely exhibition called The Music Makers which combines photographs by Joshua Hayes with works by artist Philip Surey. 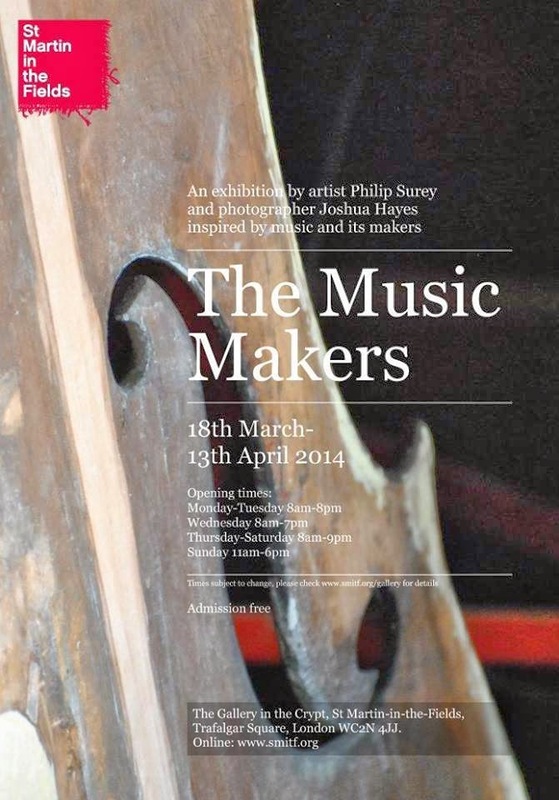 The exhibition is inspired by music and its makers and Joshua Hayes has photographed a wide variety of those involved in creating music, both the performers, composers and the craftsmen who create the instruments. Hayes has photographed three composers; myself, James Whitbourn and Johann Sebastian Bach (the stained glass window from St. Sepulchre without Newgate). And Philip Surey has produced a sequence of works based on these three composers' works, with painted cotton hangings and slate carvings. My Dearest Hedgehog is described by its author, Henrietta Bredin, as a divertissement or entertainment and, though surely diverting and entertaining, the work is far more than that. Using spoken narration and Richard Strauss's songs, Bredin gives us a picture of the tempestuous marriage between Richard and Pauline Strauss. The work was presented in Middle Temple Hall on 18 March 2014 as part of the Temple Music Foundation's 2014 season, with soprano Gillian Keith, narrators Oliver Cotton and Penny Downie, plus Stephen Barlow at the piano. Spoken narration, delivered by Oliver Cotton and Penny Downie, was interleaved with Richard Strauss's songs sung by Gillian Keith accompanied by Stephen Barlow. The evening opened with a magical performance of Morgen (written in 1894, the year the Strauss's married) with Keith's sweet-toned lyric soprano combining a fine sense of line with attention to the words, resulting in beautiful but dramatically intent performance. The music, if heard at all today, is generally performed as a suite of six movements arranged for symphony orchestra. 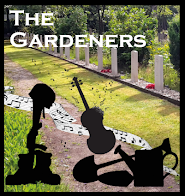 The original is scored for a pit band of 14 players, and the complete incidental music has been edited by Palmer and in this form was premiered in 2012, the 23 March performance will be the work's London premiere. Also in the programme are the London premieres of two of David Matthew's arrangements for string orchestra, of Elgar's String Quartet and Malcolm Arnold's String Quartet No. 2. These will be complemented by music by Robert Simpson. Palmer and the orchestra are recording the entire programme for issue on the SOMM label. Further information from the Orchestra of St Paul's website. 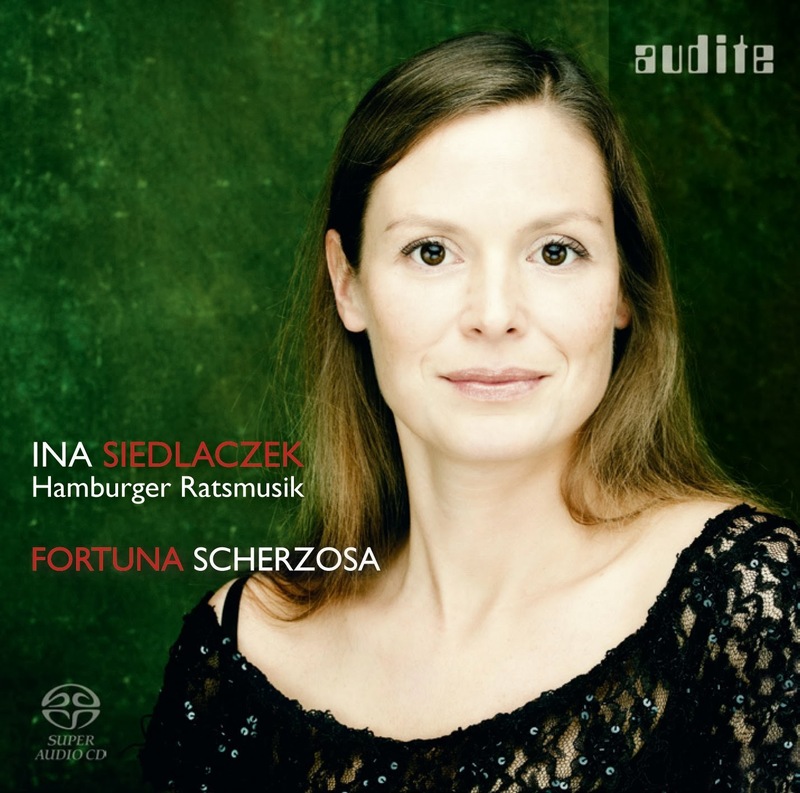 This new disc on the audite label from soprano Ina Siedlaczek and Hamburger Ratsmusik presents a selection of baroque cantatas, with Telemann's Fortuna Scherzosa, Amore heisst mich freudig lachen and Hoffnung placed alongside cantatas by Philipp Heinrich Erlebach, Johan Ulich, and Johann Philipp Krieger, all of which have texts which look at the fickleness of fortune or fate. You probably have not heard of most of the composers on the disc, their output has rather suffered from the depredations of time and war with not much surviving, but there are certainly some little gems to be found on this disc. Classical Opera led by Ian Page presented a concert performance of Mozart’s rarely heard La clemenza di Tito at the Cadogan Hall last night (13 March). Written as a commission for Leopold II’s coronation as King of Bohemia in September 1791 Wolfgang Amadeus Mozart (1756-1791) wrote La clemenza di Tito while he was in the middle of writing The Magic Flute – and it was his downfall. Mozart was not even first choice to write the opera. Domenico Guardasoni who was arranging the production first approached Antonio Salieri (1750-1825), who was too busy to write an opera in the two months left before the coronation date. Unlike the Magic Flute this was to be ‘opera seria’ – serious opera for a serious occasion. Mozart called it ‘opera vera’ – true opera, because it was based in historical fact. The original libretto (1743) was one of many heroic stories set by Pietro Metastasio (1698-1782). Metastasio was very popular at the time eventually becoming poet laureate to the imperial court in Vienna. The three act opera was reduced to two, by Caterino Mazzolà (1745-1806), by cutting out one scene completely, and by combining arias to form duets and trios.